I've got decorating on the brain these days. Here's my routine lately. By day, I work on client graphic design projects until 7 or 8. Sometimes when I walk to the kitchen to get a drink of water, I get stalled staring at blank walls for five minutes, trying to figure out what to do to them. I force myself to snap out of it and get back to work. At night, I eat supper, put on a fun TV show in the background, and surf the internet for furniture, art, and decorating ideas. I should be heading out to meet new people, I know it. But work is really busy at the moment and by the time I wrap things up for the day, it's later than I'd like and I'm tired. Want to see some fun tutorials I've found during late night browsing? Maybe you've come across them already, but they were new to me. Shown above: how to spray paint vinyl chairs at Little Green Notebook. 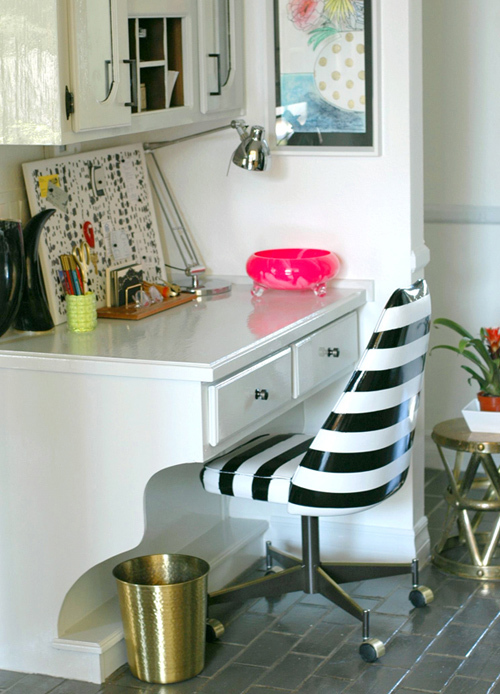 Jenny transformed a nasty thrift store chair into this black and white beauty. I love it! Find tons of interesting DIY projects on her blog. Check out Taryn's pretty white side table transformed with paint and an old trellis she found in her yard. See her steps at Design, Dining + Diapers. Mari of crab + fish emailed me about one of her DIY projects, and while poking around her site I found her gold nightstand. At first I thought it was spray painted, but no. That's gold leaf! Learn how to transform your own table right here. No, thank YOU for posting it! Oh, my husband. He's traveling a lot. Or working on planning a men's retreat. Sometimes he's in the living room near me and I force him to stop what he's doing and look at something on the internets, usually prefaced by "what if we..."
Thanks so much for including my gold leaf nightstand--honored to be included in such great company! I really couldn't believe the vinyl chair transformation when I saw it. Pretty impressive. A great re-use I'd say! Hi Jessica, This was a delightful post. 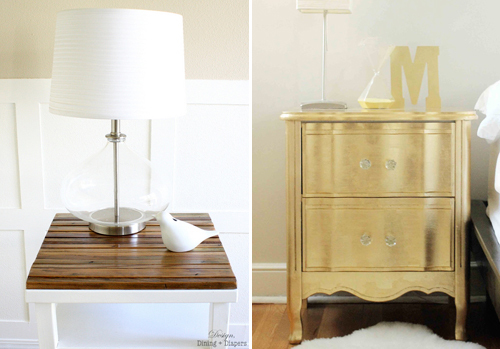 I loved the makeover as thrift finds turned into a new piece just sends me over the edge! The stripped vinyl chair is absolutely classy! Thanks for sharing! I'm always looking for fun DIY projects (and corresponding blogs) to take on! all three are great. such fun ideas! Too fun. Love, love that black and white chair! Well, Jess... we have a couple of those type of chairs in our basement if you want to do your own stripey thing. Take note, though, that they're not all that comfortable a chair. I don't know if I love you or the opposite. My feed is now full of the rabbit holes (awesome other blogs) that you've sent me down. Thank you, I think?